Atsuhiro Ito was born in 1965. He launched his career as a visual artist in the late ’80s, and in ’98 began presenting sound performances at art exhibitions and so on. Ito made use of fluorescent lighting (which is also an element of his art installations) in the creation of an original musical device called the optron. He continues to refine the instrument while approaching sound and music from a contemporary-art-based perspective. In addition to his solo exhibition and performance projects, Ito is active in a number of musical units. 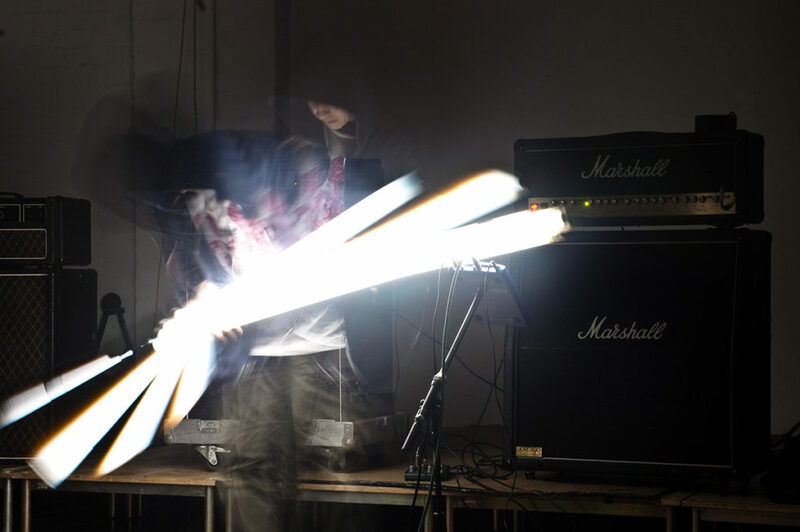 One of these is Optrum, the explosively loud “extreme optical noise core band” consisting of Ito and drummer Yoichiro Shin. Between 2000 and 2005 Ito presented various sound (music)/visual image-related events at Off Site, the now-defunct gallery/free space in Yoyogi, Tokyo. The Optrum album Recorded was released in June 2006 on the label Unknownmix (Headz).